One of the most important responsibilities of the New Brunswick Museum is the preservation of its collections: to care for the collection so that what is here now, for our study and enjoyment, will also be here for future New Brunswickers. Every employee and volunteer works to make sure that the collection objects of the museum are not damaged by accident or inappropriate use. That is why there are restrictions on food and drink in the museum galleries, why some collections are shown at low light levels or for very short periods of time and why visitors are asked not to touch the displays. Conservators may have a background in a very specific field like archaeology or art history or as a furniture maker or potter. 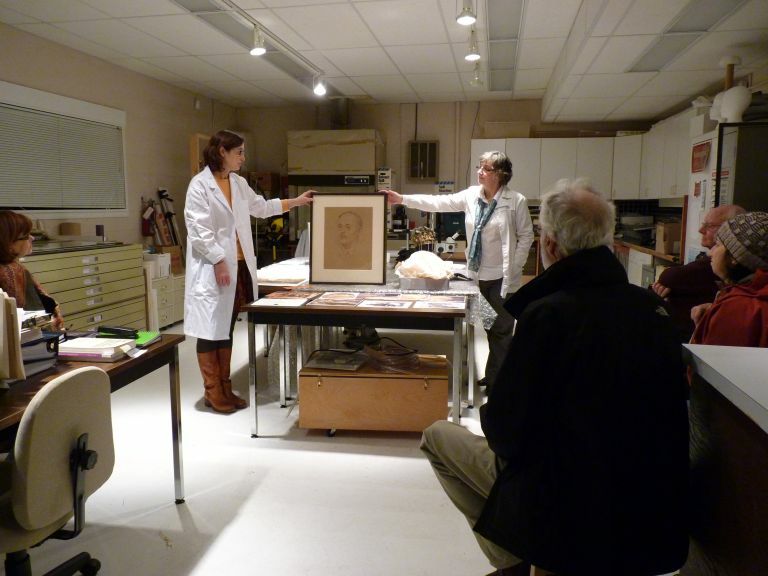 To become a conservator, Canadians can study conservation treatment methods at recognized conservation training programmes at college or university. Graduates acquire applied post-graduate experience through on the job internships and fellowships. Within the NBM, the Conservation Section is responsible for the active preservation of the collection: cleaning and repairing damaged artefacts and determining the physical requirements and limitations of collection items for storage and for display. Usually, conservators specialize in the care of a particular collection material or category of artefact like archival materials or furniture but may be concerned with general or preventive conservation care of a wide range of collection artifacts, as is the case at the NBM.